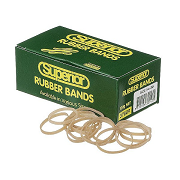 Seamless, high quality life rubber bands in a range of sizes in convenient 100 gram boxes. Which size? Rubber bands are measured via three dimensions – length, width, and thickness. Pinch a rubber band at each end as if to lay the band flat. The distance from end to end is the band length. The width of the band is perpendicular to its length.